Srinagar along with his family, who were Kashmiri Pandits: the Hindu minority within a Muslim-majority Kashmir that was becoming increasingly agitated with the cries of 'Azadi' from India. The heartbreaking story of Kashmir has so far been told through the prism of the brutality of the Indian state, and the pro-independence demands of separatists. But there is another part of the story that has remained unrecorded and buried. 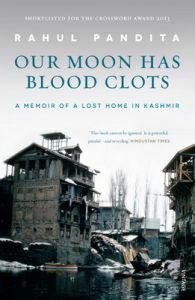 Our Moon Has Blood Clots is the unspoken chapter in the story of Kashmir, in which it was purged of the Kashmiri Pandit community in a violent ethnic cleansing backed by Islamist militants. Hundreds of people were tortured and killed and about 3,50,000 Kashmiri Pandits were forced to leave their homes and spend the rest of their lives in exile in their own country. Rahul Pandita has written a deeply personal, powerful and unforgettable story of history, home and loss. Rahul Pandita is the author of the bestselling Hello, Bastar: The Untold Story of India’s Maoist Movement and the co-author of the critically acclaimed The Absent State. He has reported extensively from war zones including Iraq and Sri Lanka, and Kashmir and Bastar in India. In 2010, he received the International Red Cross Award for conflict reporting. Rahul was born in the Kashmir Valley. In 1990, when his family was forced into exile, he was fourteen years old. He lives in a Delhi suburb, and works as an associate editor with The Hindu.